Iwadono Mountain Castle (岩殿山城, iwadonoyama-jo) is the mountain castle located in Otsuki, Yamanashi. It was built around 1530 by Oyamada clan. Because it was located at the gate of Kofu from Kanto region, Iwadonoyama Castle was very important castle for Takeda Clan. The castle was used a huge rock which is 634m high, and top of the mountain was Honmaru but also the tower of a smoke signal. Now, it has great view of Mt. Fuji and all Okutama, Chichibu mountains. Be careful. The steps to top of the mountain are very hard. Iwadonoyama Castle was considered as one of the strongest castle in Eastern Japan. It is located where Katsura River and Katsuno River meet. In 9th century, Mt. Iwadono was used for Tendai Buddhist Temple. In 16th century, Oyamada clan ruled this mountain and built the castle. In 1509, Oyamada became one of Takeda Samurai. As Samurai of Takeda, Oyamada and Iwadonoyama Castle was very important to protect Kofu from Hojo and Uesugi. Mt. 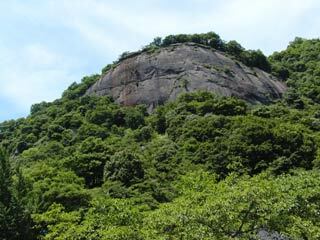 Iwadono is 634m high made of a huge rock, therefore there is only few pass to reach the top of mountain. At the top of the mountain, you can see Koshu Road and entire valley. Takeda Shingen used this castle also the tower of smoke signal. This is one of the main reason that why Takeda Shingen and his army were so strong, because he believed that the speed and accuracy of the information was the most important to win the battles. In 1582, when Oda Nobunaga invaded Kofu, Takeda Katsuyori escaped toward this castle, but Oyamada betrayed Katsuyori and closed the castle and road. This betray of Oyamada caused a downfall of Takeda Clan. However, Nobutada, the son of Nobunaga, executed Oyamada after this battle, because Oyamada was considered as the worst shameless Samurai in the history of Japan. After Tokugawa Ieyasu opened his government, he kept this castle as fortress to protect Edo. Today, because it has great view of Mt. Fuji. The view of Mt. Fuji is chosen as one of 12 cool Looking Fuji.